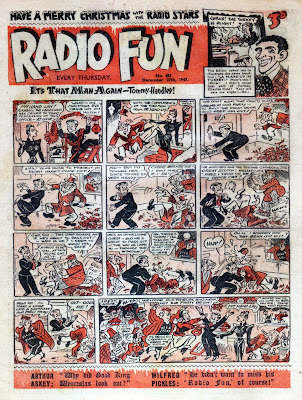 Hurtling further into the comics time vortex we arrive at Christmas 1947 and the festive issue of Amalgamated Press' Radio Fun is here. 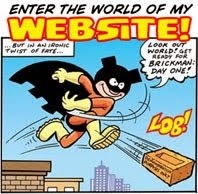 One of the more contemporary comics that A.P. 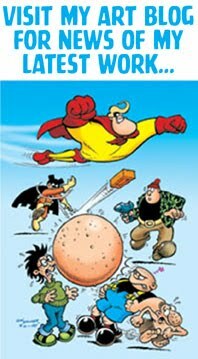 launched to rival Thomson's Dandy and Beano, Radio Fun ran from 1938 to 1961 and merged into Buster. I'll be taking a more detailed look at Radio Fun in 2010 but for today let's leaf through a few pages of this particular issue. The cover character of this period was Tommy Handley, star of ITMA (It's That Man Again), a very popular radio show that spanned 300 episodes from 1939 to 1949. 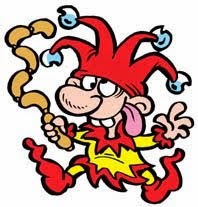 ITMA created several catchphrases, some of which have become so ingrained in the national consciousness that most people who use them today wouldn't even know where they originated from. Case in point: panel five, with Colonel Humphrey Chinstrap's "Don't mind if I do", and the final panel with Mona Lott's "It's being so cheerful as keeps me going". The artwork for this cover is, I believe, by Swedish born Alex Akerbladh, who also drew the early episodes of Issy Bonn and the Finkelfeffer Family (below) for the same issue. On the facing page is a text story adventure of Petula Clark, - complete fiction of course, but readers were expected to believe it. 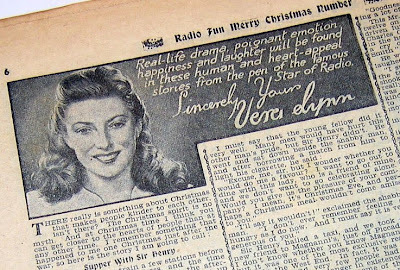 Stretching credibility even further were stories "from the pen of the famous star of radio, Vera Lynn". In truth, the stories were undoubtedly the work of an anonymous freelancer or staff writer, but adding a celebrity's name to the header was all part of the glamour of Radio Fun. 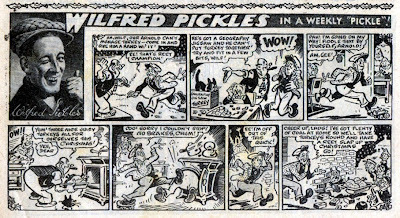 In his Christmas episode Northern comedian Wilfred Pickles indulged in some traditional British comic festive hi-jinks by kicking a fat bloke into an oven. 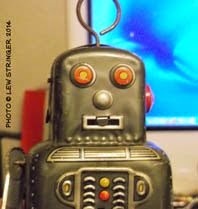 The inevitable promise of a slap-up feed concluded the tale, or as Wilfred put it "a reet slap up Christmas go". Artwork is, I think, by A.P. 's finest, Roy Wilson. 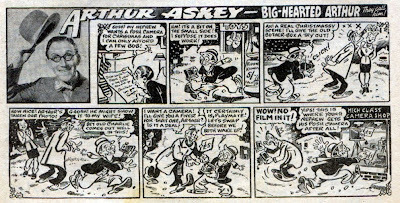 Reg Parlett provides a nice Arthur Askey strip for the issue. The plot about the man's infidelity (albeit just an innocent stolen kiss) was the kind of situation that showed Radio Fun was aimed at a slightly wider age range than A.P. 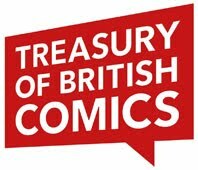 's successors, Fleetway, IPC, and Egmont, would pitch their comics at. 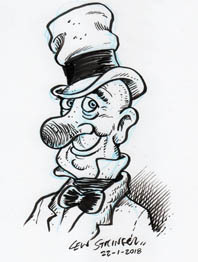 The Jimmy Jewell and Ben Warris strip uses a plot about a Christmas tree that I imagine was old even then! 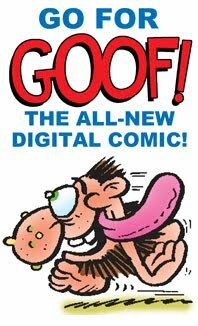 According to Denis Gifford's old ACE newsletter the artwork is by Reg Parlett, but I'm not so sure. Can anyone confirm? 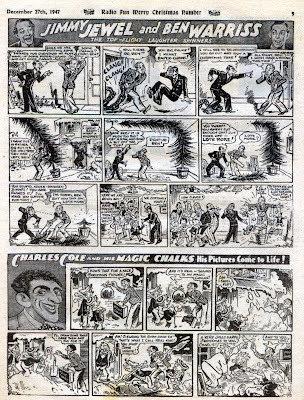 The strip beneath it features Charles Cole and his Magic Chalks, - an obvious precursor to IPC's Chalky. I have to admit I sometimes find the work of Roy Wilson and his imitators hard to distinguish but I think this is by Wilson. 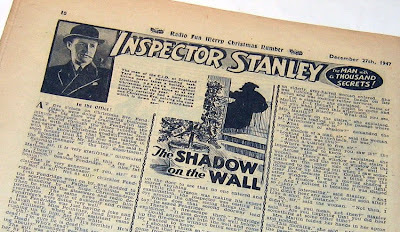 Detective stories were always a popular theme in British comics and this issue of Radio Fun featured a complete seasonal thriller with Inspector Stanley and The Shadow on the Wall. Rounding out the 12 page issue, on the back page, was the very popular series The Falcon. 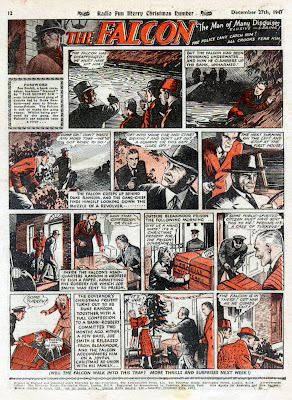 The dark tense artwork is by George Heath, father of Private Eye cartoonist Michael Heath, and grandfather to 1980s Marvel UK staff colourist of Combat Colin, Sophie Heath! Back in time again with another Christmas comic soon, chums! Wow - that looks like a fun issue. 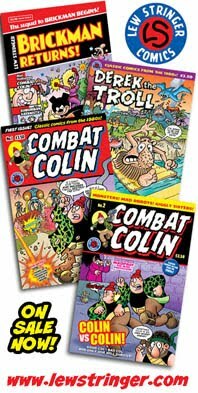 Even for an adult, it must have provided a longer reading experience than most comics today.